« Sticks and Stones – Metal and Cloth! Did you notice the leaves are out earlier this year? 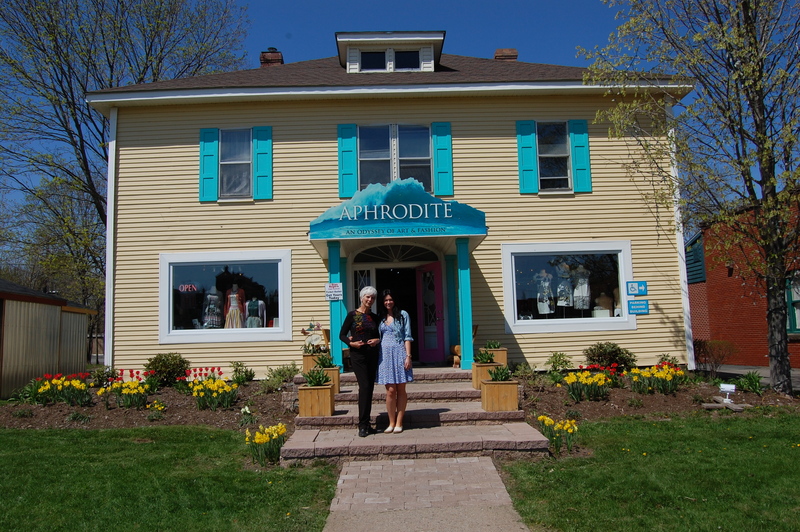 The fresh bright colours of spring are in full bloom inside and out at Aphrodite! Click on our site if you’re not in already and see why we are so thrilled with our new spring arrivals! Mary and Laura on our front walk. Be sure to tell Minoli she did a great job on our flowers! We have just put out our fresh new spring collection of Eric Alexandre – one of our top selling lines for spring. This Quebec based brand is designed for the confident woman who, now in her thirties, wishes to project an image of easy-going class. Our customers rave about our mid-priced collection, consisting mainly of basic sustainable, practical items, enhanced with exclusive details and available at great prices. Featured in the APHRO Cheap & Chic Boutique is the new spring Kollontai line – also from Montreal. Click on the link and check out the flirty dresses and separates. You won’t find this line anywhere else in Nova Scotia. Here’s one of our customers wearing one of my favourite Kollontai dresses. Too cute! The little bolero jacket is by Kaffe. Kollontaï is the fashion label of Gabrielle Tousignant and a workshop employing over twenty people who share a passion for made-in-Canada fashion apparel! From the first creative impulse to the final stitch, all stages of the design and manufacturing process take place in their Montréal-based workshop. Each one of the garments combines uniqueness, aesthetic appeal, comfort, and quality. The rich interplay of colors, textures, transparencies and lace create a distinctive style inspired by lingerie. I see strong shades of Moulin Rouge! State of the art design and state of the art manufacturing – this fabulous knitwear line from Germany has now arrived at Aphrodite. Trying on some Kooi and loving it! Come try it too! SANDWICH – 2 for 1! The summer collection is almost ready. To make room Sandwich Spring is on a 2 for 1 special. Originating from the Netherlands SANDWICH is now the best selling line in the UK and one of the top lines in Europe. Our clothing is ethically made and designed as originals by real designers. I am having my Kollontaï tunic-dress for months – I do know about its Class and Quality! I like design!!! But, look at new arrived dress on Emily!! What a luxurious combination of grey & pink! … did Emily buy the Kollontaï dress?